What comes to your mind when you first think of a collaborator for a makeup line? An actor? A YouTube personality? An artist? Well, throw all those antiquated notions of out the window, because The Brant Brothers x MAC's unisex makeup collection has arrived — and no, it doesn't matter even a little bit that you might have no idea who they are. But, don't worry, I'll fill you in. I interviewed the Brant brothers to learn more about their work with MAC and the line itself, but I think to truly understand the collection and the pair, it's important to know a bit about their background, first. 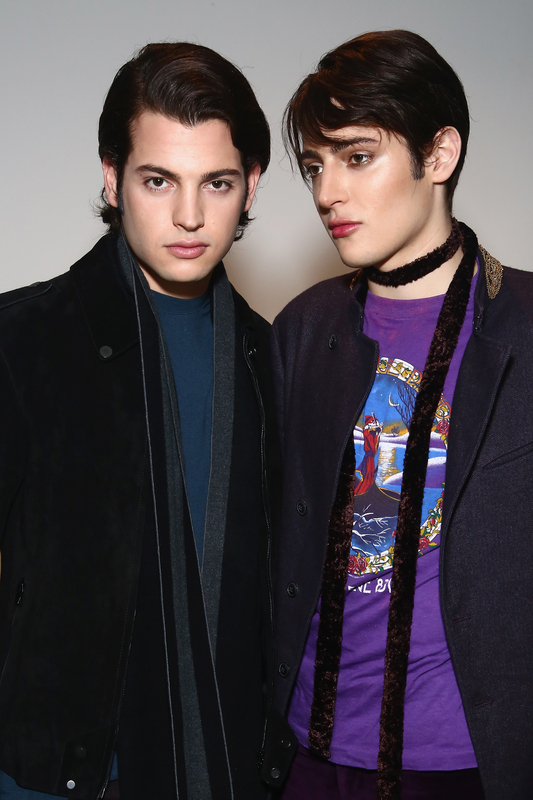 Peter Brant II, 22, and Harry Brant, 20, are sons of supermodel Stephanie Seymour and Peter M. Brant, a businessman, art collector, and philanthropist. They are, in a phrase, New York City socialites. The kind who grew up with multi-million dollar paintings in their home and were only mildly phased by any of it. "Oh, that? It's nothing," I imagine a 10-year-old Peter Brant II saying of the Warhol hanging in the study as he takes a long drag from a cigar and scoffs because, yet again, a classmate doesn't understand the importance of ~real art~. The Brants are the kind of famous people who are matter of fact about the splendor of it all. They post photos from Naomi Campbell's birthday party like it's any other day because, well, it just is for them. While it's easy to imagine the Brant brothers being followed around by TV cameras Kardashian-style, something tells me it isn't for them. And this is what's important to understand about the pair. Whereas some people have reality shows, the Brant Brothers have profiles written on them in The New York Times. They're above it all, and frankly, they know it. They're Real Housewives without the need for instant gratification because, surprise, they have been gratified by all of life since pretty much day one. But this isn't to say that the Brant Brothers don't do anything; it's the opposite, in fact. In addition to dealing with the pressure that comes from having famous parents and, frankly, quite a lot to live up to, the Brant Brothers have carved their own path. In addition to a successful modeling career, the Brant Brothers have now released their second collection with MAC Cosmetics. But it's not just any collaboration; it's a line of unisex products and a much-needed reminder that makeup isn't reserved for women — it's for anyone and everyone. And, spoiler, the products — which include a sculpting kit, eye kohls, lip stains, and more — are great. I spoke to Harry and Peter over the phone to discuss their love of makeup, the collection, and everything in between. Granted, during said conversation, I was on speaker phone, there was no announcement of who was speaking, and they were (from what I could gather during the five-minute call), traveling from sidewalk to elevator to apartment to car. I was both pleasantly surprised that they are not, in fact, carried everywhere they travel but also completely unable to tell who was saying what. I, of course, tried my best to identify which brother I was talking to, but it's really anyone's guess. When asked what inspired them to start wearing makeup, Peter (or perhaps Harry) notes that the reason he began to play with products had to do with a reason many of us could, surprisingly, relate to — well, minus the paparazzi part. "What inspired me would probably be from acne — to cover it up before going out and being photographed. It kind of turned into a profession and once you start to play with it, you realize there’s no limits to what you can do with it. It’s really quite addictive," Brant says. When it comes to their daily makeup routine, probably-Harry-possibly-Peter says that every day is different, and he simply does "what feels good" — an important hallmark of both being an heir to a multi-billion dollar fortune and makeup, if you ask me. "Sometimes, you’re in the mood to have strong eyebrows or a little bit of highlighter — whatever you feel like at the time," Brant says. "Sometimes when I go out I wear a little bit more or sometimes I don’t wear anything at all. You just go with it and you do what feels good and whatever makes you feel the best." When it came to his daily makeup routine probably-Peter-possibly-Harry says that if he were to describe his entire daily routine, "he would seem completely ridiculous" and he's not about to ruin the mystique any time soon. "I feel like if you give away your beauty routine you kind of ruin the whole mystery about makeup," Brant says. While the mystery that is the Brant Brothers may live on, the fact that their makeup collection is versatile, high quality, and full of staples for pretty much everyone is something we can all appreciate, I think — whether we have an Andy Warhol hanging in our living room right now or not.